fellowship. 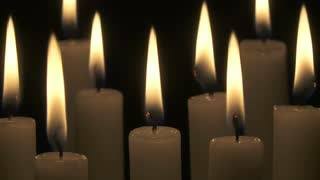 We’ll provide white candles. No need to bring your own candle unless you wish. 1. I enjoy softly listening to this soothing musical mantra for healing. “Om tare tutarre ture svaha” can protect our minds from negative thoughts and vibrations, and it awakens our inner compassion. 2. A very easy way to calm your mind and emotions is the acupressure technique of massaging your ears to stimulate hundreds of acupoints on the ear that represent the entire body. Place your thumb on backside of ear and your index finger on frontside, as though you’re pinching your ear but massage in circular motion. Move around the entire front and back surfaces of both ears for 1-2 minutes. They will soon feel warm, and your mind will relax. You may do this during the day when you’re stressed or at night to help you sleep. 3. Try one Random Act of Kindness each day. It could be as simple as complimenting a stranger on something you admire about them, such as their jacket or necklace. Or pay double for your coffee and ask the barista to use the extra to buy a coffee for the next person in line. Something I love to do is carry Andes chocolate mints or Hershey chocolate kisses in my purse and give them to people I encounter during the day — for no reason at all — cashiers, someone next to me in a checkout line or crosswalk, a friend, etc. It brightens their day and their sudden smile brightens mine. Click here for other suggestions.